A suspect at the center of a child homicide investigation turned herself in Monday evening, nearly a month after the Alameda County District Attorney’s Office filed a felony child abuse charge against her with a special allegation of willful harm or injury resulting in death. Prosecutors allege Vallejo-resident Holli Barlow, 29, failed to obtain medical care for 3-year-old Eden Lynch, who was in her sole care on August 31, 2011. Child Protective Services reports show Barlow called 911 after hearing a thud and finding Eden unresponsive next to her toddler table. 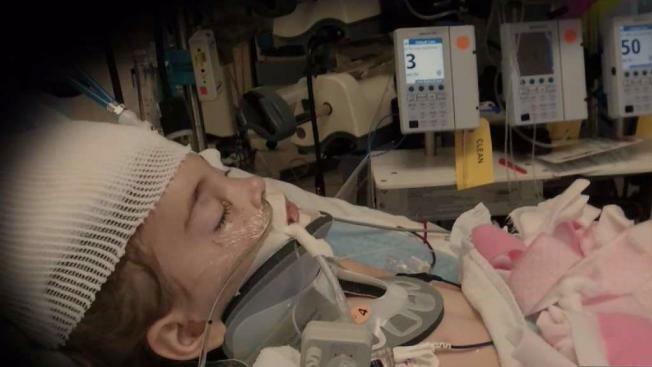 Paramedics rushed the little girl to Children’s Hospital Oakland, but Eden never regained consciousness. She died three days later. The coroner ruled Eden’s death a homicide, caused by blunt-force trauma. The latest development in this nearly 6-year-old cold case comes after weeks of questions from the NBC Bay Area Investigative Unit about the little girl’s death. The Alameda County DA declined to comment on the case. She is the second person to be charged in connection to Eden’s death. Prosecutors with the United States Coast Guard charged petty officer Jimmy Barlow, Eden’s father, with four counts of felony child endangerment last July. He faces a military court-martial scheduled to begin December 4. After Jimmy was charged last year by the Coast Guard, Eden’s maternal grandparents contacted NBC Bay Area, frustrated the Alameda County District Attorney’s Office never filed charges against Holli. Jimmy Barlow’s attorney denied any wrongdoing by Eden's father and Holli Barlow. He told NBC Bay Area last month that Eden’s death was the result of an accident. A message to Holli Barlow’s attorney was not returned in time for this article. Holli and Jimmy Barlow, now married, were dating when the father was awarded custody of Eden. Four months after she came to Alameda to live with her father and Holli Barlow, Eden was dead. According to medical records obtained by the NBC Bay Area Investigative Unit, Holli Barlow told doctors at Children’s Hospital Oakland that Eden collapsed while playing at their Alameda apartment. Holli Barlow told medical staff Eden had fallen down a flight of “seven-to-eight concrete steps” nine days earlier. CPS reports show doctors didn’t believe Eden’s injuries matched Holli Barlow’s account of what happened. They alerted Child Protective Services and the Alameda Police Department. Now, just days after mourning the sixth anniversary of Eden’s death, her mother said she learned Holli Barlow was in custody when the Investigative Unit contacted her during a work meeting where her colleagues were discussing their faith. Holli Barlow’s arraignment is scheduled for Wednesday afternoon at the East County Hall of Justice in Dublin.